If you are a member, the Member Center is especially for you, where you can update your profile, view our member directory, share documents, and view and share on our updated Forum! If you are not a member and are interested in becoming one, you may join us by clicking on the Join or Renew your Membership under Quick Links on the right-hand side of our page. For more information about us and what we do, please view our About Us page. If you would be interested in sponsoring our website, you can find more information here. You may contact us at: [email protected] or click here. Our officers are listed here and our committees are listed here. Thanks for visiting our site. We hope you return soon. I am hopeful this email finds you all well and that you enjoyed some time off during the holidays to share with family and friends. I am sure we are all experiencing the wonderful Maine winter weather as well as the school budget season that is upon us. If you have not received the attached information regarding CDS from your Superintendent please reference the attached. The information represents L.R. 1977 as well as a Conceptual Framework Summary prepared by MDOE. The first year of phase in for this proposal relates to fiscal 2019-2020. Tyler Backus has provided a summary regarding ESSA Report Card and per pupil expenditures. Please reference the attached and if you have questions please contact Tyler. Also attached is information regarding the 2019 Northern New England Facility Masters Conference to be held in Durham, NH on February 27th & 28th. 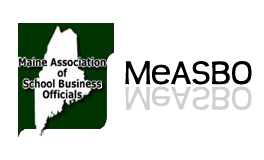 On behalf of the Executive Committee I want to thank you for your continued support of Maine ASBO. Please do not forget to have measbo.org bookmarked and keep checking for updated information. Several members of MeASBO are willing to offer time and answer questions as mentors to new Business Managers. Feel free to reach out to these folks if you are looking for some assistance in an area, and they will be happy to help you out and direct you to some resources. If you are interested in being a mentor, please let someone on the Executive Committee know and we will add your name to this list.